Have You Met A Girl Named Thursday? I thought that this would be a fun way to start the day since it’s THURSDAY!! Lost in a good book by Jasper Fforde. I listened to the first in the series, The Eyre Affair on audio when I was still commuting. Funny story, I had gotten this and the next book in the series at the library book sale. I didn’t remember that I had read the first book, wanted to start at the beginning, got the first book from the library. When I went to list the book in Goodreads, it told me I had already read it!! Duh!!! As I’ve been reading Lost In A Good Book, I’m remembering parts of the first book now. Regardless of my bad description, I’m really enjoying this. I started reading it because I wanted something light that I was pretty certain I would enjoy for the actual driving part of our trip. However, I may be finished before we leave. I have the next one ready to start. Oh yes, the reason for the title…the main character is Thursday Next. Seems I’ve also used the word “next” quote a few times already without intending to! Speaking of books, I’m already re-thinking what I’ve already packed in my book “suitcase” for the trip. Some of my finds from the library book sale on Saturday need to come along for the ride, so I’ve got a re-do to do! Speaking of suitcases, I’m mostly packed. Ralph…I’m not so sure. I’ve got all of my regular clothes in my big suitcase, and I’ve started on my overnight bag. Just need to remember socks…just remembered I forgot socks…Yikes! Now I just have to pack up the snack bags ( oh yeah, I have to BUY them first!) and the food stuff bags that we’re taking. I hope this car we get has a Really Big trunk! Yesterday I had the most beautiful walk you can imagine! The sky was clear and the weather almost felt like Fall! Incredible! Today will be my last walk before vacation. I have to go to Weight Watchers to weigh in tomorrow (not looking forward to it…) because I won’t be able to go on Saturday! Don’t like to exercise before weighing in. So that’s Thursday…a little disjointed, but then…that’s what you’re used to! Let’s get the feet on the pavement, One More Time! This entry was posted in Uncategorized and tagged books, sorting and packing, Ultimate Blog Challenge. Bookmark the permalink. enjoy your walk, fran! that is so nice that you really appreciated your surroundings/the weather yesterday – then walking becomes a meditative experience, too! thanks for the book review! and yes – repack your book bag! leave clothes at home if you must, but ensure you have tons of reading material!! i am loving light reads right now – with more time to read, i ploughed through “the undomestic goddess” by sophie kinsella (fabulous) and now started “explosive eighteen” by j evanovich – also 50 shades of grey is in there, but that i read only at home, i need another book that i feel comfortable reading in public! good luck with the packing!! Thanks, Cathy!! I love that you have some reading material that must remain private! These are really fun books. I know there are more, I need to find them and continue the adventure. Yes…some repack is necessary!! Have a great day! I’ve been a litttle hectic the past two weeks and have been lax on reading my friend’s blogs. Loved this blog of yours. That sounds like an interesting book to read. Have lots of fun on your trip. Thanks, Marie, I’m really enjoying the book, think you’ll like it! Well, actually Marie I just got through a zombie-esque section in this book, but a fun one. I think you’d like this series! I love the Thursday Next series! It’s just plain FUN. I’m really enjoying it, Allie! I need to find the others now! Yesterday was just gorgeous…today’s forecast…99 but it will feel like 110! WHAT? 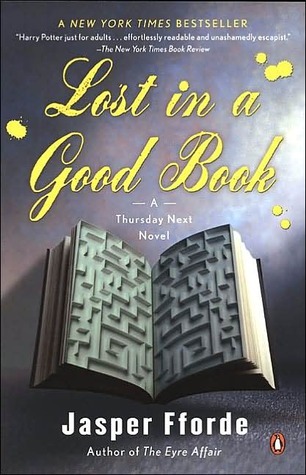 I have read some of the Thursday Next books…I really liked what Fforde did with the characters (I loved Miss Havisham…). They’re very clever! I’m prepared for that, Zo! That’s why I’m taking so many…Back ups!! Zo – are you implying there are more than two in that series?????? Yes, Val there are at least 3 and I think there are more. You’re right about non readers not getting it…I’m sure that would be a problem. Val, you really need to join Goodreads!! It’s so much fun! Hope you had a great walk Fran!!! Thanks, Roz!! It was a good one today!! I always learn about interesting new books on your blog! I actually have a list in one of my notebooks: books I saw on blogs. I get most of them from you, Kiki (Cathy) and Allie (Forgottenbeast). How cool would it be if we all lived within driving distance and we could have a book club? I’ll answer that myself: it would be SO TOTALLY AWESOME!!!! BTW, November is only little over 3 months away! Are you thinking about doing NaNoWriMo again? Or was once enough for you? Hi Cutie! I love that you get book ideas from me! You should joing Goodreads. A real live book club with all of us together would be incredible, but I suppose we could do a virtual one. In fact that’s a pretty good idea. Yes, I am thinking about doing NaNoWriMo again. I had a question though…is it against the rules to do work in advance? I have what I think is a good idea and I would love to start outlining it, but wasn’t sure if that was allowed. I was actually going to e-mail you about that! The Thursday Next books are great…fun and clever, I think you’ll like them! I don’t think it matters! NaNoWriMo is just 50 000 words, and I think any “real” book that I want to write would be longer than that. And besides, if you outline it first…well, the thing would be a whole lot easier to write come November! I’m writing now. If I’m not done by November, then I’ll keep working on it. If I am done, then I figure I’ll write a new one! As for Goodreads…I tried, but I got overwhelmed. I honestly didn’t even know where to start. Ok, So then I have a project to work on while on vacation! I like it!! Thanks, Stephanie! Snack bags are the most fun to pack! Ahhh I’m almost looking forward to fall. Paige, I am ALWAYS looking forward to Fall…my favorite time of year for so many reasons. Still haven’t gotten to those snacks…need to get my act together!